Display a DVI-D signal on a DVI and HDMI®-equipped monitor simultaneously. 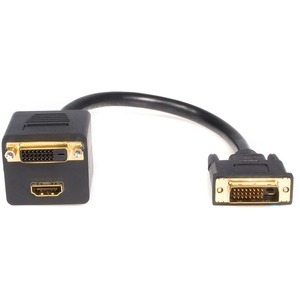 This 1ft DVI to DVI+HDMI Splitter Cable splits the digital DVI signal output by a computer or satellite receiver into one DVI and one HDMI output, allowing you to view content on one DVI display and one HDMI display simultaneously. Backed by lifetime warranty, our DVI to DVI + HDMI splitter cable offers guaranteed durability and reliability.